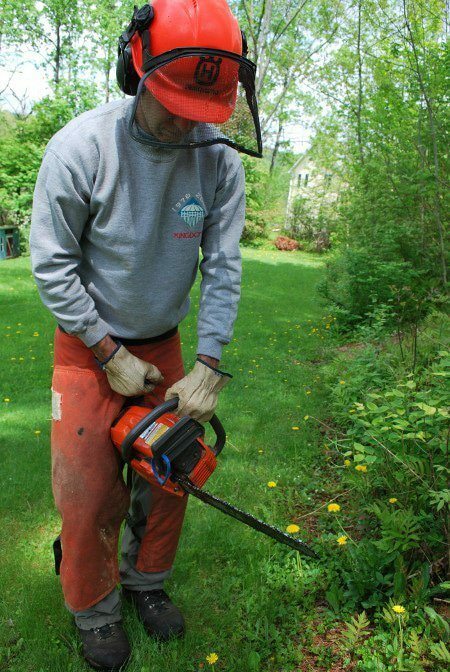 Chainsaws provide homeowners the opportunity to trim their tree gardens and cut firewood without engaging professionals. However, first-time users get apprehensive when using the tool, citing safety concerns. Of course, improper use of these machines can be hazardous; loss of limbs, injuries to the neck and head, and even death. I thought I’d put together an article to help beginners understand how to work with a chainsaw safely to cut trees, and logs. The trigger and throttle controls are located at the back of the machine. A trigger control can't engage with the throttle lock deactivated, which prevents the device from accidentally starting when the engine is running. These are just a few chainsaw tips for beginners to feel confident when handling a chainsaw. 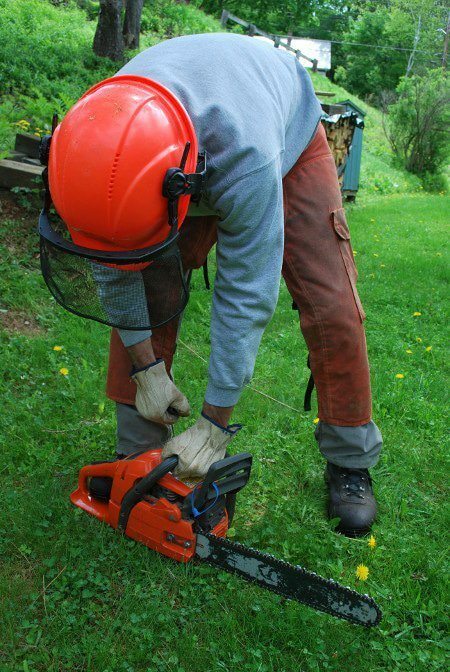 There is a host of other activities that beginners need to learn when using chainsaws. You first need to get acquainted with the three basic tasks that come with operating the machine: bucking, limbing, and felling. Bucking involves cutting the cut tree trunk to length while limbing is the removal of the branches of the cut tree. Felling involves skillfully cutting the tree so that it falls where it is expected, so it is important that you take the appropriate precautionary steps before doing it. Before discussing limbing, bucking, and felling, you need to know how to cut with a chainsaw. You begin by checking the controls, bar, handles, the chain's tension and sharpness. Be sure to fill the oil and gas reservoirs before using the saw. Basically, there are two techniques used to start a chainsaw; on the ground and between your legs. Ensure the chain brake is engaged and the choke is closed for both methods. 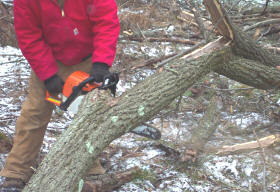 If you are starting the chainsaw while on the ground, lay it on the surface and hold the handlebar using the left hand. Afterward, place the right toe on the handle where the trigger is and yank the starter rope. Several pulls should get the saw popping; at this point, deactivate the choke and pull the starter rope. The chainsaw should start. If you are starting the saw between your legs, be sure to position the rear of the saw against the right leg while tilting it to the right. After that, follow the procedure discussed earlier. Begin by checking for any obstacles surrounding the area. These include power lines, fences, and buildings. You want the cut tree to reach the ground unobstructed. Secondly, examine the tree's condition- is there a rotten part that may break off or lose branches? Plan for the fall. Note that most trees adopt a natural direction when falling, which is often affected by their shape and size, hence the need to make careful assessments prior to cutting. Plan your path of retreat when the tree is falling. Be sure to clear any surrounding bush or vegetation. Begin by trimming any branches on the log. A sixteen-inch chainsaw provides ample cutting speed, power, and capacity without being too heavy. You can then cut the log into small pieces (16 inches long) for use in fireplaces or woodstoves. Be sure not to cut the log all the way if it is lying on the ground. As such, make a shallow groove into the wood and space them evenly without busting out the tape measure. Don't cut the log using the nose as it may cause a kickback. Place the motor housing on the end of the log and let the bar lie flat on the log. When you have cut ¾ of the way through the log, roll it 180-degrees and cut through the remaining quarter. You begin by assessing the position of the tree; whether it is raised from the ground on one end or both ends. Cut three-quarters of the log resting on the ground. 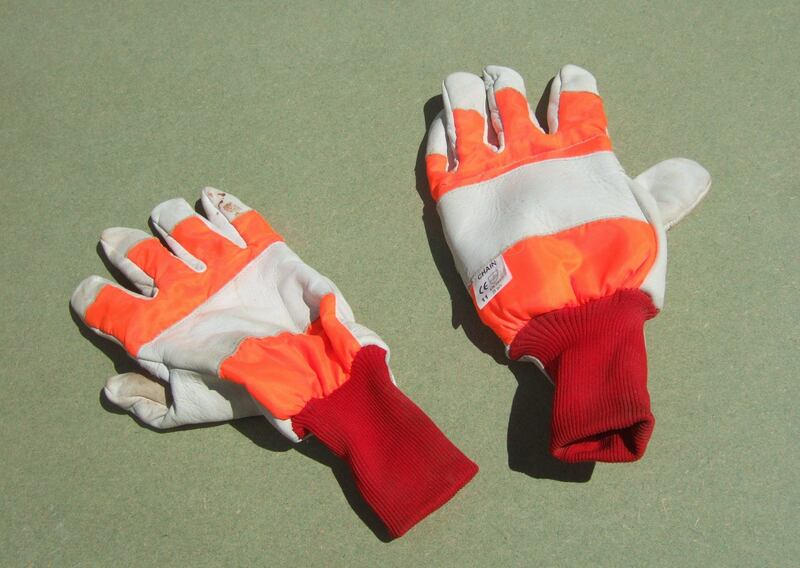 Avoid using the tip to prevent reaching the chainsaw kickback zone. Use one of the eight-foot logs to mark the rest of the trunk every sixteen inches with an ax blade. Cut the log at every mark by cutting on one side and rolling the log to cut through the other side. Repeat the process for all the logs until you have chopped all the trunks into firewood. Before using a chainsaw, read the owner’s manual to understand the safety features and all the controls. Knowing how to use a chainsaw safely also involves wearing protective gear for ear and eye protection, hard hat, heavy-duty gloves, long pants and a long-sleeved shirt, and a pair of sturdy boots. A chainsaw helmet comes fitted with a mesh face shield, and flip-up earmuffs may come in handy. You need to hold the front handle using the left hand with the thumb wrapped underneath when cutting. Note that the saw cuts best when the engine is activated at full throttle. Cut away from the bar tip. Cutting using the upper section of the tip may cause a kickback or engage the chainsaw chain brake, which can be dangerous. Chainsaw techniques for bucking involve cutting the tree into log segments that are usually required by mill requirements. The cuts are made in squares to measure the length of the log and maintain its value. Safe tree bucking requires you to determine the direction that the log pieces will move after the cut. It is only possible by cutting the compression wood first as it allows the log to move towards the direction of tension. 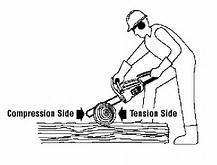 When bucking large logs, make several cuts to release tension wood; for small logs, however, two cuts are enough. The first bucking cut should be shallow, as it is intended to severe a short length of compressed wood. The second cut should release the tensioned wood. 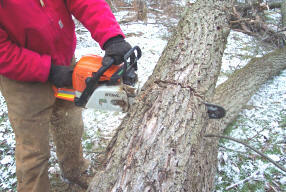 There are two tree cutting techniques with a chainsaw; slicing upwards and downwards. Most trees are cut by placing the chainsaw above the wood and cutting through it. Gravity pulls the cut piece away from the tree, so you can continue this way. However, when the tree trunk is under tension, cutting from the top down causes the wood to pinch and may get stuck. As such, it is best to cut upwards by placing the saw under the wood and cutting upwards through it. Using a plastic wedge helps keep the large log from pinching the saw chain. I hope you enjoyed this tutorial and found it useful. I found it especially important to know how to use a chainsaw properly after a storm knocked down one of the trees in my yard. 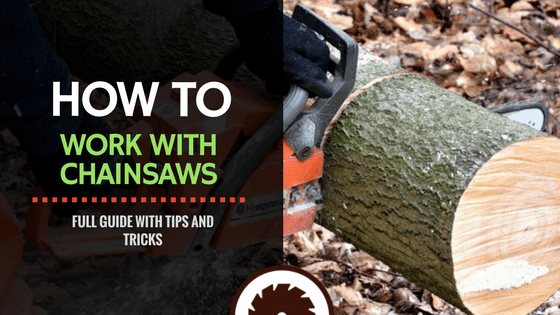 Getting professional help during the winter can be pretty difficult at times, so I thought it’d be useful to help others learn a few basic DIY tips on how to use a chainsaw properly. Don’t hesitate to leave a comment if you have any doubts or suggestions, and please don’t forget to share this article if you enjoyed it!